Posted: Tuesday, February 14, 2017. 9:59 am CST. Posted: Tuesday, February 14, 2017. 9:45 a.m. CST. By BBN Staff: Reports reaching our newsroom is that there is a crocodile in a canal in Belama Phase 11 in Belize City. Several concerned residents have taken to social media raising their concerns over the presence of the animal. 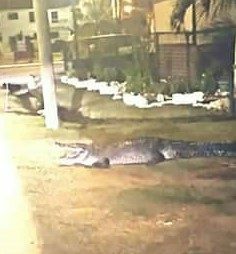 Some pictures and videos are circulating on social media showing a large croc crossing the street. The residents say that the croc crosses the street early in the morning and then around 7:30 at night. Parents are concerned since a lot of children traverse the street to go buy at a nearby Chinese store. Residents are making a plea to the relevant authorities to look into this situation.